Synopsis:"Nathaniel Hawthorne's gripping psychological drama concerns the Pyncheon family, a dynasty founded on pious theft, who live for generations under a dead man's curse until their house is finally exorcised by love." Initially I found myself very pleasantly surprised by how much I enjoyed this book set in 19th century Puritan New England. There was an eerie quality, a quiet subtle sense of suspense that drew me to find answers without a heart pounding urgency to solve the mysteries behind the inhabitants of the house. I was slowly drawn into the riddles of the Pyncheon family. What is the identity of the boarder in the house and how does he fit into the picture? What has so saddened those gentle people living there? Why is such fear and loathing shown towards their cousin, Judge Pyncheon? What could possibly have been done to them to bring them to these straits? 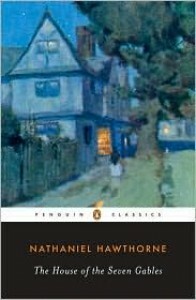 Hawthorne painted such a vivid picture of Hepzibah Pycheon, the aged owner of the house who finds herself trapped by her heritage and beaten down by life and her fall from a wealthy gentile life to one where she finds herself with the necessity to now earn her own bread although totally ill-equipped to do so. "These names of gentleman and lady had a meaning, in the past history of the world, and conferred privileges, desirable or otherwise, on those entitled to bear them. In the present - and still more in the future condition of society - they imply, not privilege, but restriction!" I can picture this woman, I know her and although I could not love her, I grew to admire tremendously yet also pitied her as the book progressed. Here was a woman who had withdrawn herself from society so totally as to be like the walking dead. The cast of characters were each shown to be more flawed and damaged than the next one until we are introduced to Phoebe, a young, gay cousin arriving from the country, bringing life and a measure of happiness back into the house. Hawthorne's beautiful prose flowed so smoothly that I just glided along with it. On the downside, there were portions of the book that were just a little too saccharine, almost wince causing: " The deepest pathos of Phoebe's voice and song, moreover, came sifted through the golden texture of a cheery spirit, and was somehow so interfused with the quality thence acquired, that one's heart felt all the lighter for having wept at it." By page 200 the same slow tempo that charmed me at the beginning of the book started instead to cloy. I was losing patience and yearned for something to happen, anything at all, just get to it, give me some answers. When Hawthorne finally revealed the truth about his characters and their history it was anticlimactic, I had already guessed what his revelations would be so there was no surprise left for me. Overall, I did enjoy the book but did not love it.